A milestone here, a milestone there: Matchday 2 saw plenty of players reach personal landmarks in their Bundesliga careers. There were also record-breaking goalscoring as well as non-scoring runs in our statistical breakdown of the second round of 2017/18 fixtures. Hertha Berlin did not commit a single foul in the first half of their game against Borussia Dortmund. The capital club have never previously achieved that in a single half in the 20 years since data collection began. Hamburg's Mergim Mavraj became the first player to be sent off in the Bundesliga this season during his side's 3-1 win over Cologne on Friday. Wolfsburg beat Eintracht Frankfurt for a third consecutive time. They do not currently have as positive a run against any other Bundesliga team. Hamburg have started a season with two wins for the first time in seven years. The last time HSV did so they ended up eighth at the end of the campaign. 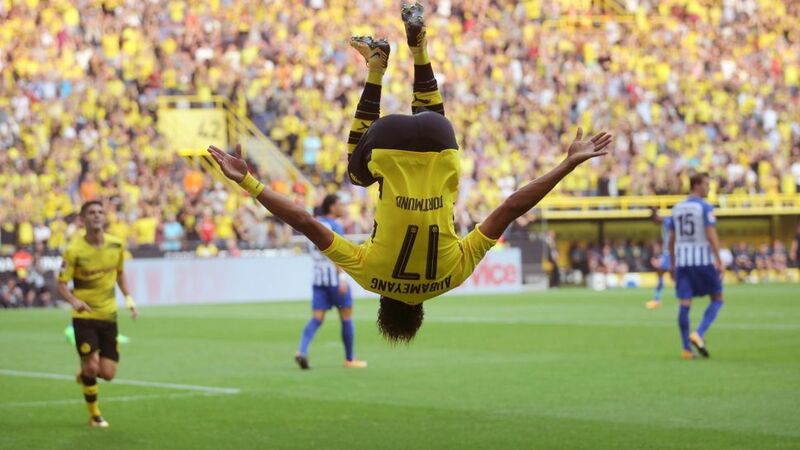 Borussia Dortmund's Pierre-Emerick Aubameyang has now scored in his last eight competitive appearances for the club - a new personal record! Stuttgart are undefeated on home turf in the 2017 calendar year, winning eight and drawing two. Hannover are unbeaten in 12 games under head coach Andre Breitenreiter (nine wins, three draws). Bayern Munich have won each of their last 16 competitive matches against Werder Bremen, including their last 14 league meetings. No team has previously ever had such dominance over another side in Bundesliga history. Alfred Finnbogason scored Augsburg's fastest-ever Bundesliga goal when he hit the net after just 34 seconds against Gladbach. At the ripe old age of 21 years and 116 days, Julian Brandt made his 100th Bundesliga appearance, becoming the youngest Leverkusen player ever to reach the milestone. Kevin-Prince Boateng also made his 100th Bundesliga outing in his first match in Frankfurt's starting line-up. Holger Badstuber ended a run of 115 Bundesliga games without a goal when he scored for Stuttgart on Saturday. It was only the second league goal of his career, coming nearly eight years after his first (in December 2009 in a 2-1 win for Bayern against Gladbach). Robert Lewandowski only had two shots on goal against Bremen, one with his left foot and one with his right – and both went in. He now has 154 Bundesliga goals to his name, putting him level with Mario Gomez in the league's all-time scoring chart. Hamburg defender Dennis Diekmeier is still yet to score after making his 183rd Bundesliga appearance at the weekend. That is the longest ever goal-drought in the history of Germany's top flight. Lukasz Piszczek played his 250th Bundesliga game on Saturday, becoming the first Polish player to reach that landmark. Bremen's fixture against Bayern was their 1800th Bundesliga match. The 2-0 defeat means the Green-Whites have lost 593 times, although they can point to 761 wins.